I'm off to Avalon tomorrow and really must not visit Blogland before I go! I'll leave you for a few days with a couple of thoughts! 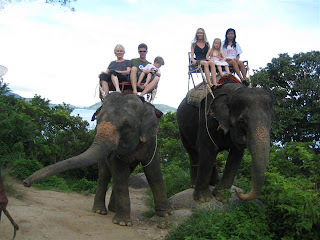 Dear grandson, Byron, said to me this afternoon, "Nanny, how come you are going away again - you have just been to Thailand with me?" That's him in the middle - as John Lennon would sing "Beautiful Boy"! "It was by chance we met, by choice we became friends!" 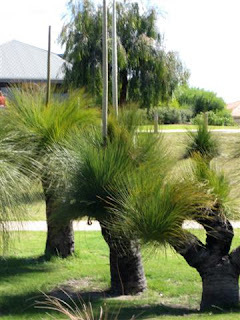 I don't know if you remember, there a little while back, I posted about our Australian flora showing you pics of our wonderful Blackboy Trees - they are very prolific here in Western Australia. Yesterday, as I was walking the puppies around my lake (not really MY lake, just the one very close by in suburbia! ), I came across these glorious specimens - those very tall whitish things reaching up from the top of the leaves are their flowers - isn't nature just amazing? I will say, simple things make me happy, and I am easily pleased - these certainly do - just love them! I don't usually walk everywhere with my camera, but yesterday I knew there was a beautiful pelican swimming about and I had hope to get a nice pic of him! I bet you are all saying "There she goes again!" - not really, just kidding! Fat-quarters galore! And they're not mine - boo, hoo! I think I will have to buy some, though. Aren't they just gorgeous? Only $4 a FQ - could SAVE a lot of money here! These I am auditioning for another Split 9-Patch! This crate has a lot of Reproductions - many of them are the nice bright ones I love so much - in the middle row to the left are Regency Dandy - Circa 1810! These are mainly modern/retros - just beautiful! Wish I did own them all - there is nothing here I couldn't use! Julia has just tagged me - don't know much what it is all about - guess I will have to make time to Post again tomorrow - all about Me, me, me! - as though I don't do enough of that without really trying ! If you don't want to know, just miss my next Post, ha, ha! I'm off to a the beautiful Avalon Homestead here in WA on Thursday morning for a retreat - only 2 sleeps to go - we are all excited! 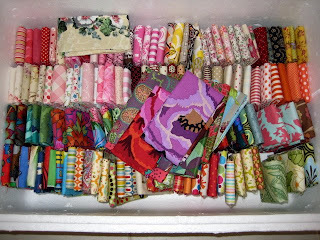 Meals on Wheels are organized for Mum so I'm going to quilt my little fingers to the bone! More Bags - Busy, Fun, Weekend! 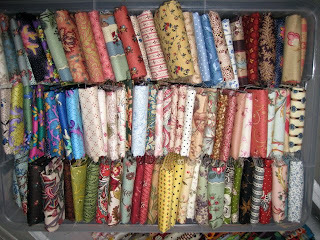 Peg from Happy In Quilting wants to know if I have a shopping problem or an addiction - work out what you can, because I really don't know (lol)! I do know I had a lovely day yesterday sewing. 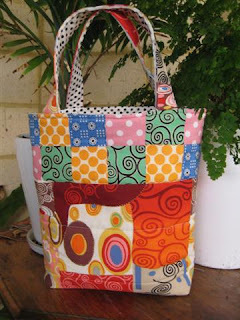 Homespun Workshops visited our patchwork group on Thursday and had a lovely bag pattern so I popped in Friday to their shop to pick up this pattern, and, of course, a wee bit more fabric! 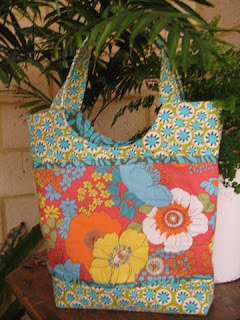 I'm so happy with the way this bag turned out - lovely shopping bag size! A really neat pattern, nice pockets and all and I'm very into these lovely happy, modern fabrics at the moment - I think the feature fabric here is Summer in the City! Hope to get some more fat-quarters through the week. Now this cutie above, is an enlargement of Pink Penguins tutorial for little fabric baskets! I did something silly (now, that's not like me!) - the lower fabric is too busy for the contrasting squares and it is a beautiful piece of fabric - a reproduction of Gustave Klimpt's work - now he was an Austrian Symbolist painter (1862-1918). Anyhow, I am really happy with the way the basket turned out, so thanks again, Ayuma - wonderful inspiration for me! It is about 12" wide, 10" deep, 3 1/2" base and 14" handles. I also put pockets in the lining. It's big enough for a quick trip to the shops or a nice size for a hand project, such as knitting! Mmmm, might be a nice Chrissie present for a sock-knitting girl! We are having a sock-knitting demo here on 2 Dec.
Today I must become a domestic engineer again - not a good thought! Hugs and thanks for visiting - Lurline! I wasn't going to Post today - I was going to be really serious about sewing! Seeing I had to go out to lunch and am now waiting on a storm to pass to walk the puppies, I decided the sewing will wait until tomorrow! 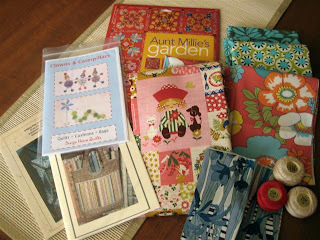 Here's my 'goodies' - Aunt Millie's Garden applique pattern - I have been chasing it for quite a while! 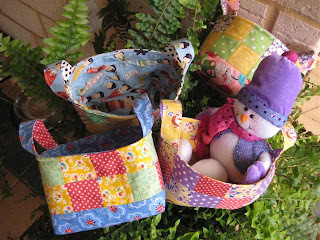 Another 3 patterns, a bag, a cushion and cute little clowns and caterpillar designs done with yo-yos. In the middle, just glorious fabric I couldn't resist - maybe a cushion top for Ronald McDonald House and plenty left over, because I just love it! Then on the right, fabric for a new bag as per pattern, Perle threads and into the lower middle a Liberty hankie for a Christmas gift for someone! Friend Barb basted my Charisma quilt on her long-arm machine, so of course I had to start stitching last night - if you click on the quilt to enlarge, you may be able to see how the big stitches look - I'm looking forward to completing it to see how it all turns out! Georgina didn't pose for this picture - this is just how she is about anything I am hand-sewing - even if I throw a block on the floor to view it at a distance she is straight onto it - lucky Maltese don't have a doggy-smell or shed hair! 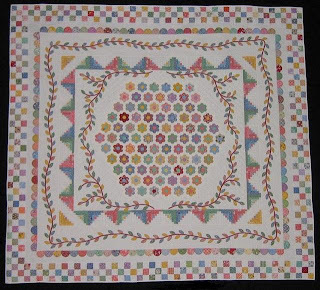 By the way - Charlotte, 'Char' has contacted me and it was great to visit her - she's at TobycatCreations - maybe you would like to visit to tell her how gorgeous her little quilt is that she sent to me for DQS5! The sun is coming out - so, we didn't get much rain out of that - better walk the puppies, then maybe a bit of sewing, or maybe just some hand-quilting! 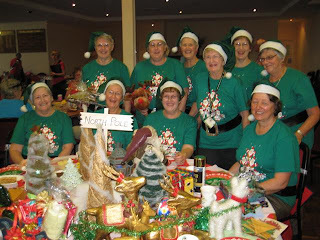 PS - Peg from Happy in Quilting is having a party today - there have been updates all day - worth a visit to join in - she really shows how crazy we Aussie girls can party. Go back to Older Posts to enjoy it all! Beautiful Dolly Quilt - Dolly Quilt Swap 5!! Oooh - I am so lucky! 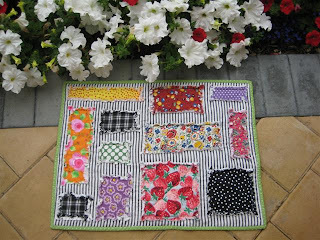 Look at this beautiful little Dolly Quilt - I just love it!! I received this in the mail yesterday and it came from Charlotte in Mishawaka. I have yet to make contact with Charlotte as I don't have her email or blogspot address - will certainly be trying hard to track her down. Charlotte, if you are watching, please contact me! This little quilt is so me and there is a lovely quote on the label "Your work is to discover & then, with all your heart, give yourself to it. Buddha" - how beautiful! 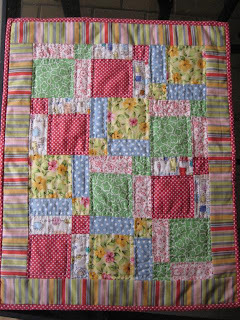 Charlotte has certainly put a lot of time and love into this little quilt - again - thank you! It's Friday again and guess what - I'm off to Shop Hop again! Hopefully will have something nice to show you next Monday. Until then, have a great weekend! Little Smarty Pants here was wrong - we didn't win any prizes for our WAQA party theme - Countries! Oh, well, nice for somebody else to win for a change (lol)! 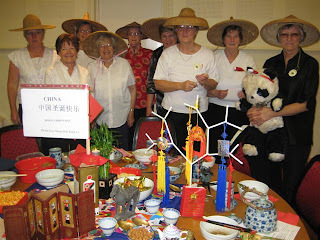 Above here we have the ladies representing China - they won a prize for Best Decorated Table and certainly well deserved. This group here won for Best Dressed and oh, my, they looked just fabulous! Santa's Elves from the North Pole sure stood out in the crowd. Their outfits were wonderfully co-ordinated and whoever before has seen green elves hats! 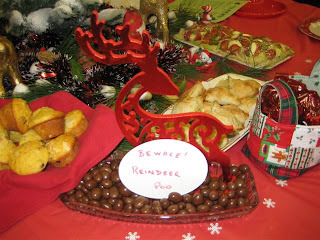 Dear friend, Gwen, joined in with the spirit of it all , Reindoor Poo (no - chocolate covered peanuts, really). Oh, and notice the Little Fabric Basket Robin had made and filled with choccies! Once again a great day! Chookyblue will be happy to know my Secret Santa parcel was posted to the US yesterday - I'm looking forward to hearing lots of comments when everyone opens their presents at Christmas! 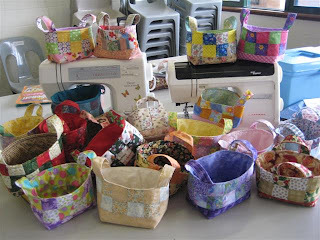 Must away - I'm off to my local patchwork group - expecting to see lots more fabric baskets for Show and Tell - I'll take piccies if that happens - I had 12 prints done yesterday to give to the girls who took part in the mini-workshop last week! 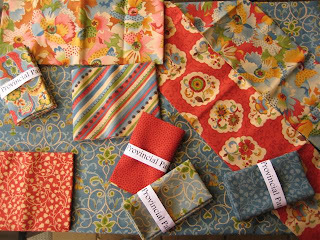 Well here it is - I have been telling you about the gorgeous fabrics I bought from Kerri and Julie at Provincial Patch! What a weekend I had sewing - lots and lots of interruptions! Initially, I had 9 fat-quarters and border fabric - had to add another 2 fat-quarters to make finished quilt something like 60" x 53" including a 4" border. Fortunately I had the extra fat-quarters on hand and they all play beautifully! I cut my squares 6 1/2". 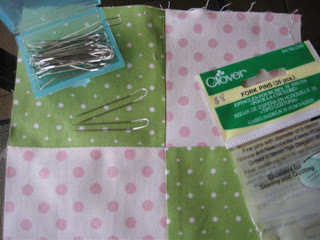 Easy-peasy to sew - not so easy randomly placing blocks, which I wanted to do! Usually I throw blocks down - look good - okay - let's go! Blues couldn't sit against border then the red blocks that madly "pop-out" had to be strategically placed. 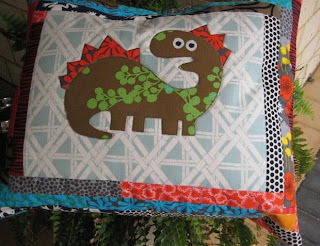 You see, I want to hand-quilt in big stitches with Perle thread using a stand-out design with cream thread on the red blocks. So far, I'm very happy with the results - let's hope it looks as nice as I envisage when quilting is done! Off to our state guild's Christmas Bash today - the theme is "Other Countries" - we are representing Canada - we are a cheeky lot and have been known to win best display a couple of times - here's hoping! We'll certainly stand out dressed in red and white - all decorations in red and white! I've just taken a leek and asparagus tart out of the oven - 9 eggs I used, the recipe by well known Australian chef said 14 - the tart shell I made would not have taken that many! Hugs and best wishes for a happy day! 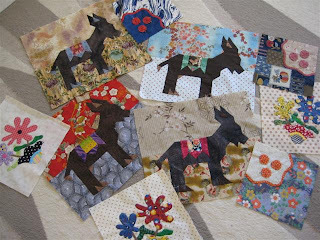 Someone recently showed some donkey blocks - sorry! forget who - and they jogged my memory of a UFO! Something else jogged my memory again this morning, so decided to drag these out to show you! 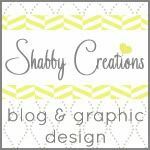 A few years ago, our Creative Threads group (now Girlfriends!) 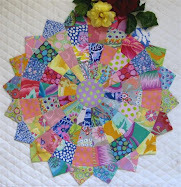 decided to do a Recipe Quilt - some of the ingredients being applique, flowers, curved piecing, stars. I think the three circles grouped as they are represent stars in Japanese. Very few of the girls finished their quilts and those who did, the quilts were stunning! Oh, well, move on Girl! 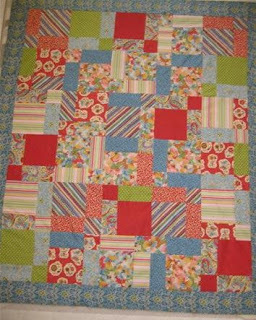 ... off to finish piecing Split 9-Patch quilt - will show you soon - seems to be coming along okay. It's Friday again! Yesterday, the girls at the Rockingham Patchwork Group were so enthusiastic about a mini-workshop on Pink Penguin's tutorial, just look what they achieved - nineteen little baskets were made in a couple of hours! They had their fabrics pre-cut and ready, brought their sewing machines along and with a little help and guidance from Robin and this Little Black Duck they came up with Baskets Galore! Wendy had almost completed her second before we left! I'm sure lots of Christmas gifts will come in little baskets! Kerri and Julie of Provincial Patch dearly wanted to tattle-tale on me about more retail therapy that I have been having, but they didn't let the cat out of the bag! These Darlings came from their online shop - arent they just beautiful? The range is Charisma by Chez Moi for moda fabrics and I just love them! Out of bed early this morning, ready to Post then start sewing! Separate phone calls from both dear daughters who needed Mum - I love them both so much and they are my best Girlfriends, but I lovingly tell all my kids 'they should have been drowned at birth'! They all know they are my greatest priorities in life! 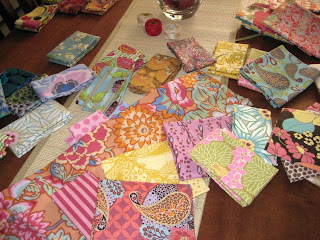 I am thinking of making a split 9-patch with the above fabrics and hand-quilting with the big stitches that I have become so besotted with lately - a bit late in the day to start now, but I'll think about it! 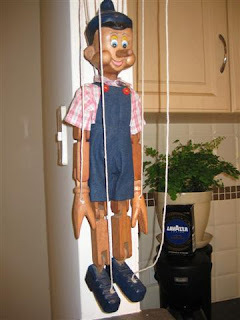 This little guy, Pinocchio, I love so much - he recently came from Thailand and now hangs just over my kitchen bench - maybe not the best place to hang him, but this is where I can see him most and enjoy his company ! Enjoy your weekend - really hope I can get some sewing done - hugs! My goodness! This Post is so skew-wiff! I'm having a technically bad day - firstly my camera is on a blind? setting, but still working! Maybe you should read the latter first - anyhow! above is a bathmat I made over the weekend - I'm sure Bonnie Hunter of Quiltville would be so proud of me - I made this bathmat using an old towel as the 'batting', lovely black and white striped ticking for top and backing and a few fun fabrics 'backed' with flannelette. then shaggy-snipped! Of course, then thrown into the washing machine and dryer. I'm sure it will be beautifully absorbent and will be used for years to come - after all, we are all very clean after we get out of the shower or bath! What a lovely day we have all had together - lots of catching up with news of each others lives and chatter and book swapping and Show and Tell and mini-tutorials - my goodness! - thank you Girlfriends for coming and so sorry to those who could not make it! It was lovely to see Lynnie again - such inspiration with her knitting and crochet prowess AND she works in Sophie's patchwork store Materialise, so how good is that? 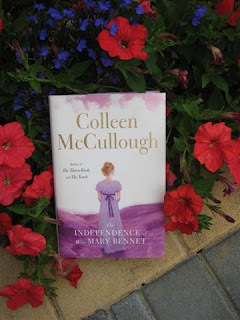 Dear Robin brought along The INDEPENDECE of Miss MARY BENNET by Colleen McCullough. Mum can't wait to get her hands on it - Robin says it is a good read - let me know if you enjoyed it. On the back cover there is a quote, the first sentence being "All that I want is to be of use, to have a purpose." Isn't that what we all want? I'm a bit embarrassed about this great cushion above! Dear friend, Pat, has made it for our donation to Ronald McDonald House that we do annually - my naughty mother cadged it to put on our piano stool to elevate her legs which she needs to do. How bad is that! Ninety years old and I'm supposed to embarrass her not she embarrass me! Isn't it just so gorgeous! Have lots more to talk about, but shall leave the rest 'til next time - a couple of very busy days ahead - shame we have to sleep, isn't it? Hugs! Mmmm ... I'm Feeling a Little Bit Guilty! Retail Therapy has overcome me - also lovely UFO's! Let me first tell you Christine of Once Upon a Quilt ... is having a Give-away - it doesn't close until the end of the month, I think - thank goodness that is a long way off! 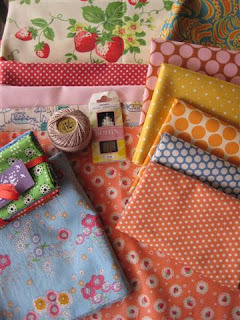 Next - last week's shopping trip to Materialise and Calico and Ivy - how is that strawberry fabric! 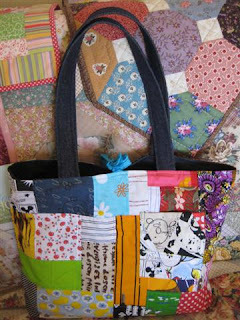 I just love it, but won't be using it in the near future - too many other ideas, not to mention quilts to make. This was yesterday's damage - a few must-haves and some more creative juices flowing. 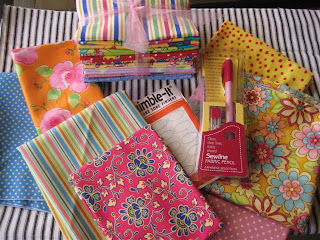 I can't live with out Thimle-its and friend, Barb says the Sewline fabric pencil is a must-have, hope so and I will be trying it out very soon! Wish I could say I had made this bag - no, bought it at the markets in Thailand, just before Danielle was robbed, if you remember. I took it with with me yesterday and it was a nice size for the shopping I did. Anyway, it was a lovely day and Barb, Jan and I had a lovely lunch at Chatters - Thai seafood salad for me, yum! I have been ratting around in cupboards and boxes for the last couple of hours trying to find a pattern - well, I did in the very last box that was left - I have done this before! I came across lots of lovely things including books and patterns, so I'll prepare some stitching to do tonight and then have a little read! Hope you are all enjoying yourselves - hugs! Oooh - a little chilly here this morning and we are well into spring! Look at the cutest little fabric baskets - tutorial from the Pink Penguin! I have been looking at them on other girls' blogs and thought they may be too fiddly for me - well, they are really nifty and easy once you have done the first one. Thank you so much to the Pink Penguin! I made four on Wednesday and took them along to show the girls at one of my sewing groups yesterday for Show and Tell - a lot of them are very enthusiastic about making them for Christmas gifts, so we are having a little sew-and-sew next Thursday. It will be interesting to see the little baskets created by a group - I will post a piccie! DD, Angela, will be over after dropping the kids at school - she's a hairdresser, so time for a little trim and blow-dry, then I'm off to meet friends for a little retail therapy, then lunch. Guess where the retail therapy will happen! Nearly 4 years ago I moved from Brisbane/Queensland to Perth/Western Australia to be with our children and grandchildren! 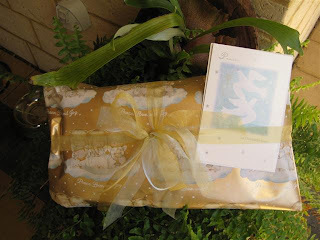 Brisbane is sort-of my hometown and when I returned there in 1994 and found the pleasure of quilting, one of the first girls I met was Christine. We spent many fun times together and formed a great friendship culminating in wonderful times with our cottage group Birds of a Feather. 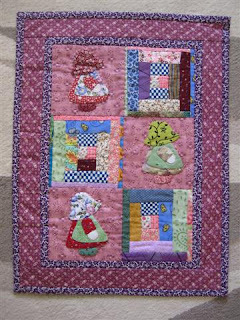 Christine is a wonderful quilter - if you haven't visited please do - Once Upon a Quilt .... - you will find some interesting reading and see some beautiful quilts. The quilt above won Retaining the Tradition and Viewers' Choice at the recent Queensland Quilt Show ! Isn't it just gorgeous? Now, this one above has a little story - a group of us were lucky enough to have Kim Mc Clean join us for a workshop where we did (sort of started!) 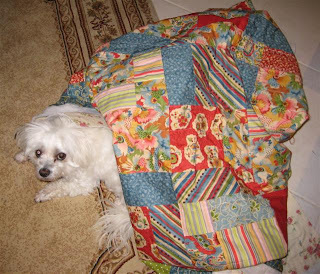 her beautiful Old Brights quilt. 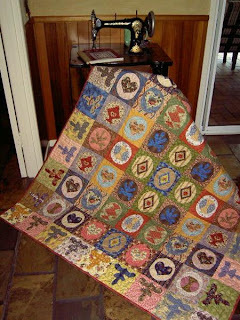 The original is a Great Australian Quilt by one Sarah Evans. A little while after I moved over here, I had completed many blocks and what loomed ahead in those busy days seemed overwhelming - so I thought - best thing is to gift them to Christine. Just look what she has done with the blocks I had done and check out the quilt of her own that she is still doing - lots of interesting reading there! Again, I say, so much for dull Reproduction fabrics - not so! I have put a Followers gadget on my sidebar, so if you do check up on me regularly, please add yourself at 'follow this blog' just above the photos - my Blogland friends are very precious to me and I love to keep in touch with you all! Off to do a little sewing now - hugs! I wasn't at all happy with the way my former attempt on the little quilt for Doll Quilt Swap 5 was turning out, so I started again and decided to do a Split 9-Patch. It's very interesting how something so simple turns out so interesting! I cut my 9-patch squares 3 1/2" and the little quilt is approximately 16" x 20" completed. Then I decided to hand-quilt with Perle thread (yes, again!) 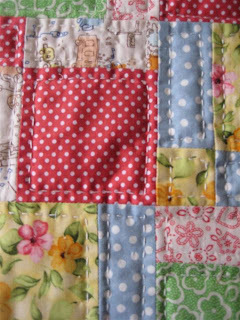 and the more I quilt with big stitches the more I am enjoying it - just adds that little something to a quilt! Have you ever used the new (well, new to me!) Clover Fork Pins - not to miss out on anything new - I had to try them and I think they are great to get perfect interlocking seams. Tomorrow is our great horse race - the Melbourne Cup - they call it The Race That Stops a Nation. Most people have a little flutter, lots of luncheons, hats, glamour, bubbly, etc. I was silly enough to trip over a trolley at Bunnings (our nation-wide hardware/garden store) yesterday, - no broken bones, thank goodness, but lots of skin off and a very sore knee, so I don't think this Little Black Duck will be going anywhere tomorrow. To those who are, have a very happy, lucky day!